Hello all my dear visitors, techno geeks and novice users. Today I will list out some outstanding features, Pros and Cons of mobile App development frameworks which I could figure out while learning to develop using them. Since last couple of months, I have been working on content driven mobile apps. I have had a good experience in learning both of these mobile frameworks while developing these two applications. 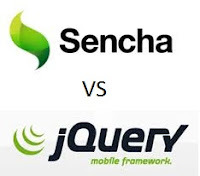 JQM and ST, both are HTML5 based Mobile App development frameworks. Lots of UI controls like buttons, panels, window, list, nested list, layouts and more native look and feel. Faster across variety of mobile devices from Android 2.1 and up. Sencha touch, one of the first mobile App frameworks, runs gracefully in webkit based browsers. Android and iOS, Blackberry OS 6+, and probably Meego also, I never tried meego. It does not work at all with Window Phone 7 or 8. Very easy to learn and implement. Not too many UI controls. At the time of writing this blog post it is in beta, consequently slower across mobile devices. Expected to be improved a lot when stable version is released. JQM, hails from community of jQuery, the most famous cross platform JS library. JQM works great with mobile browsers from Symbian, Android through iOS to Blackberry, Window Phone 7, WebOS. Conclusion: Both the frameworks are good and it depends upon your app requirements which one to use. If too much of work is to be done, just using HTML5 and JS, Sencha Touch is more appropriate. In case, you just need the UI and rest of the work needs to be done in native programming, JQM with Phonegap is more suitable. 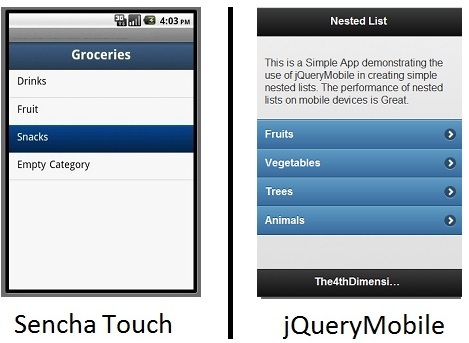 Sencha Touch works on Blackberry OS6 and Samsung Bada as well! What about something more lightweight, such as xui? I have NOT used either library, but I do just fine conceptualizing and I can pretty much tell you that w/o the help of a tool like Sencha Architect you will be up the creek w/o a paddle. If you can fork $399 for the single developer license, give it a whirl (MAYBE), but don't get your hopes too high. Tools can end up biting you in the arse. PRODUCTIVITY seems like a HUGE issue with sencha... that is my OPINION. I Really enjoyed reading your blog .thanks for such a nice information in your blog about Information and technology ..